"The Secretary of St. Barnabas Builders visited the site a week or two ago and was thrilled to see what progress had been made. Externally the church looked almost complete. How different from that cold and windy January morning in 1951 when he first set foot on the site. 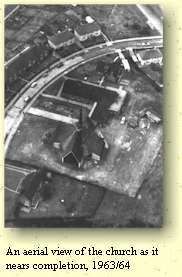 There was not a building there, but now there stands the almost complete church, the large permanent hall, the original temporary hall, the vicarage and the curate’s and woman worker’s flats. The Lord has indeed been good to us." During the summer the hut, which had served for so many years, was at last pulled down. Then on September 10th came the great day, as following more than two years of building work the church was consecrated by the Bishop of Rochester, David Say, in an atmosphere of thanksgiving to God and joy at what had been done since the original vision of Canon Guy King and the St Barnabas Builders in 1951. However, John Tanburn and the other church leaders were quite clear that the building was not there for its own sake, but to be a means of witness to Jesus; this was no time for sitting around marvelling at the new facilities, and so the consecration was immediately followed up by a parish mission, the "Summit Mission", led by Maurice Wood. Some years later it was said of this event, "For many it meant the beginning of a new life in Christ, it also marked a turning point in the life of the church, which has led to advance in many directions." So much had been achieved, but God’s work is never easy, and though the building was in many ways a great asset, it also posed some considerable problems. For a start, the architect had been sacked by the diocese without any consultation with the parish just before the consecration! Then came the discovery that the roof leaked badly. The leaking roof is still with us, and has become such a feature of the building that we now almost routinely put buckets out whenever it looks like rain.